Water availability is a growing problem worldwide due to climate change. Potential solutions, such as rain or irrigation, are viewed with fear by grape growers because of their apparent effects on the quality of the grapes. However, there is very little scientific evidence that the consumption of water by the vine can cause a dilution or depauperation of the fruit. On the contrary, excessive water deficit leads to incomplete maturation with an insufficient content of sugars and the presence of excessively astringent and bitter phenols. On the other hand, it has been demonstrated that practices such as deficit irrigation are tools that allow to optimize the productive performance of the vineyard and produce higher quality grapes. 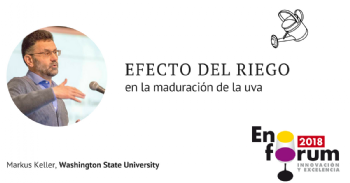 The report by Marcus Keller, "Washington State University", in Enoforum 2018 will illustrate the work done by his research team in order to better understand the role played by some environmental factors or management practices of the vineyard in relation with the quality of the fruit. Markus Keller is the Chateau Ste. Michelle Distinguished Professor of Viticulture at Washington State University’s Irrigated Agriculture Research and Extension Center in Prosser, in the Pacific Northwest of the USA. He received his MS in plant science and PhD in natural sciences from the Swiss Federal Institute of Technology in Zürich. He has conducted research and taught viticulture and grape physiology in Europe, Australia, and North and South America. 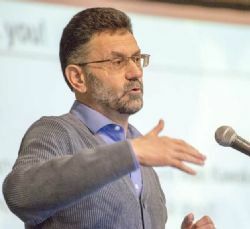 His research focuses on environmental factors and management practices as they influence crop physiology and production of wine and juice grapes. He has published over 100 scientific and professional articles and is the author of the award-winning textbook “The Science of Grapevines – Anatomy and Physiology”.